Yay! It's my first award as a blogger, and I've been putting off doing this post for so long. I'd like to thank Vee at Growing in Style for the nomination. I have to follow a few simple rules. Thank the Blogger that nominated me. Share 7 random facts about me. Nominate 15 bloggers who are relatively new to blogging. Let nominated bloggers know they have been nominated. 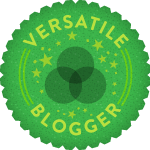 Add the Versatile Blogger Award to my post. I have 10 siblings. Yes, my parents have 11 children, I know it seems like a lot, but once you count the names on your finger, you're like "that's it?!" I'm the seventh in total. I don't know if most of you all know this, but I am a proud Nigerian, like I'd run back to my country any day proud! It's been about three years since I last visited, and I miss it so much. I use like a lot. My freshman year in high school, I took a speech class, and in our speeches, every time we used filler words like "like" "ummm" we'd get dinged, and I was great at giving an entire speech without any use of them, but as I went on in the class, I picked up those habits, which made absolutely no sense what so ever. I hate when people that don't have any form of authority over me throw commands at me. I'm very "stubborn" "hard headed" and I don't really enjoy being told what to do. Especially when you want something but can't ask the proper way. I'm very bipolar. I even get called "Bipolar Freda" sometimes, but I can't help it. It's like the good bipolar though, not the bad one. "There's a good bipolar and a bad one?" Sure there is! What I mean is like one minute I could be really sad, but then next thing you know I'm like allover the place, but then I could randomly start crying out of the blue. I'm a very quick and slightly good observer. I can read people quickly within moments of just talking to them, but I keep everything I observe to myself. Curvy, Natural, & Loving It! They all have really nice lovely blogs and you should definitely check them out. Thanks for the nomination! I was already nominated once and wrote a post about it. It was fun reading your 7 facts! I totally agree with you about being a good reader of people! LOL at you being married to all these celebrities! I'm flattered and I'm very appreciative of you taking time out of your schedule.To do something so sweet for fellow bloggers. My To-Do-List working on my acceptance speech lol j/k but my acceptance award post . Lmao you're too cute, and I'm glad you enjoyed reading them, looking forward to reading yours. Thank you for nominationg me Freda! I really appreciate it. Ditto to what Nika said, your random facts literally had me LOL! Haha I guess we just can't help but do what our minds want. Hey Babe,thanks for nominating me. You deserve this award! :D Congratulations! wowo you are so lucky to have so many sibs!!!!! love this post and thanks for telling uis more about you <3 xO! Don't forget to join my Miracas giveaway!